Check items to select them, then click Add to Cart. This Phalaenopsis Orchid, also known as the Moth Orchid, in a pottery pot is an exquisite housewarming, get well soon or Birthday gift that could last well over a month if looked after. Delivery in Durban & Surrounding Areas. Colours of orchids and type of pots may vary. Did you know, the number of orchid species nearly equals the number of bony fish species, about four times the number of mammal species and are more than twice the number of bird species? Yeah, we were quite surprised by these very interesting facts about Orchids too! A Phalaenopsis orchid in a pottery pot is a beautiful gift for a home or office, as it exudes a certain serenity, calmness and elegance that bring joy to the beholder. 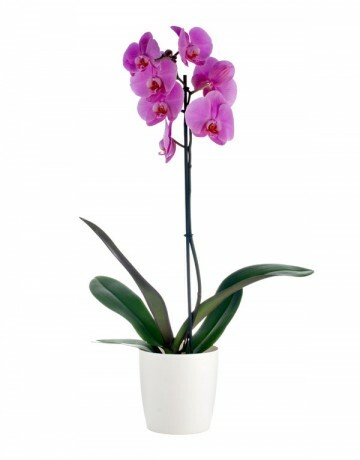 The Phalaenopsis Orchid is available for same day delivery in Durban. Keep it on a windowsill or in a location with medium bright sunlight (not direct sunlight). Give it water when the soil begins to dry out, usually every 7 to 10 days. Feel if the soil is wet, if it is, wait another day or two – DO NOT over water it, as this can cause the death of your beloved plant. Fertilize with plant food once a month. Re-potting: As soon as your orchid is finished blooming, use a fresh moss and bark mix and re-pot the plant which is essential for new growth. For same day flower delivery (Monday – Saturday), we need to receive your order and payment before 12:00pm South African time (GMT +2). Our Flowers are made up and delivered by our florist in Durban, and while we will always do our best to honour your special requests, we cannot guarantee specific delivery times. We may be able to deliver your flowers on a Sunday in Durban, provided you place your order no later than Friday. Please refer to our Delivery Information page for restrictions and excluded areas. Sunday’s are blocked in the calendar, so please choose either Saturday or Monday when you check out, and let us know in the “Special Instructions” field that you’d prefer delivery on Sunday. Note: Flower availability might be limited. Flower delivery may be possible on a public holiday in Durban with prior arrangement. Refer to the Sunday Delivery section above for more info.